Aquaphobia Socks | Domesticated Human Aquaphobia Socks | Online home of Crystal Flanagan. Knitter, spinner, sewer, weaver, canner, baker. I designed this pattern to help with hand-dyed yarns that tend to pool. The slipped stitches help to break-up the visual lines and swirls and create a firm fabric. 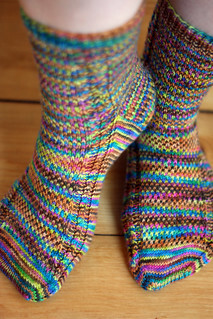 Baby cables up each side of the foot help add elasticity to the slipped-stitch pattern while the bottom of the sock is worked plain to reduce bulk on the sole of the foot. 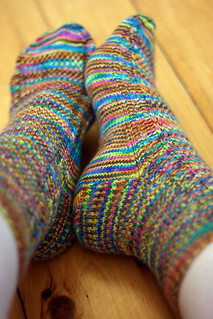 This pattern assumes familiarity with basic sock construction and knitting terminology. Notes: All slipped stitches should be slipped purlwise, unless otherwise noted, so that the slipped stitches are not twisted when worked on the following round.